Last week, students and faculty visited both the National Alliance of Independent School's People of Color Conference (PoCC) and Student Diversity Leadership Conference in Nashville, Tennessee. The conferences are an important opportunity for Pacific Ridge to collaborate with other schools on issues of diversity, equity and social justice. The mission of PoCC is to provide a safe space for leadership, professional development and networking for people of color and allies of all backgrounds in independent schools. 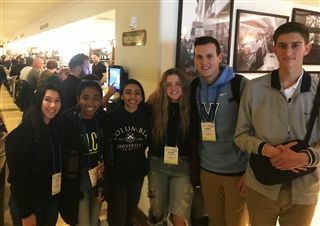 The Student Diversity Leadership Conference is a multiracial, multicultural gathering of upper school student leaders (freshmen through seniors) from across the U.S. The conference focuses on self-reflecting, forming allies and building community.